The original 7th Wisconsin Volunteer Infantry Regiment was organized at Camp Randall in Madison, Wisconsin and mustered into the service of the United States on 16 September 1861. On arrival in Washington D.C. the regiment was assigned to the same brigade and the 2nd and 6th Wisconsin, the 19th Indiana, and was later to be joined by the 24th Michigan. Initially the brigade was under the command of General Rufus King, but was later assigned by a regular army general and famed artillerist by the name of John Gibbon. Gibbon ordered the regiments under his command to be equipped with the distinctive 1858 regulation Hardee hat, Frock coats, white leggings and white dress gloves. 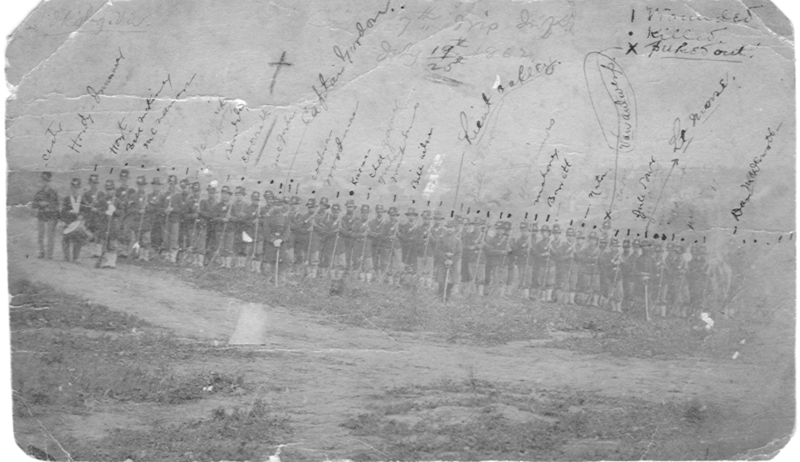 Under these auspices Gibbons brigade was to distinguish itself under fire and win the lasting and immortal sobriquet, The Iron Brigade of the West, for their service at Brawner’s Farm, South Mountain and Antietam. By far the Iron Brigade’s highest honor was earned in the early morning hours July 1st 1863 during the first day’s fight at Gettysburg, Pennsylvania. The Brigade, less the 6th Wisconsin which had been held in reserve, was engaged in a tough battle along McPherson’s Ridge near a small stream named Willoughby Run. It was here the brigade engaged the forces of Archer’s Tennessee Brigade, Army of Northern Virginia, which included the 7th Tennessee and 14th Tennessee regiments. As the Iron Brigade waited for the Confederate assault across Willoughby Run, they were joined by a now famous recruit. John Burns, a resident of Gettysburg, once constable in that town, and a veteran of the War of 1812, came up to join the fight against the rebel invader along side the 7th Wisconsin. The old man joined them carrying his rifle and wearing a swallow-tailed coat with brass buttons and a high black hat. The Iron Brigade, the 7th Wisconsin, and Mr. Burns fought hard, eventually taking up a fighting retreat back to Seminary Ridge, and eventually through Gettysburg. Without their steadfast determination and gallantry on the first day of Gettysburg, the Army of the Potomac could have been defeated. The 7th Wisconsin served out the rest of the war, keeping their hard earned honors and their Iron Brigade kinship in mind. As a statement of their dedication and hard fighting reputation, the 7th Wisconsin suffered the third highest casualties of any regiment in the Union Army.